Dennis and Stephanie Coruth have been leaders in the square dance activity for nearly all of the more than three decades they have been dancing. They became treasurers of their club, the Litchfield Swingers, the year after graduating from class. Since then they have held office in the club for twelve years including five as president. The Coruths leadership has extended well beyond their club. Four times they have chaired the New England Square and Round Dance Convention. Their first two were the 34th and 35th in Manchester, NH in 1992 and 1993. This Convention introduced the drive up check in for pre-registered dancers and callers. 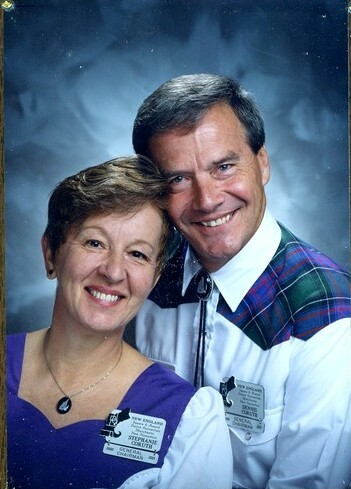 Their second involvement as Convention chairs was for the 42nd and 43rd again in Manchester, NH in 2000 and 2001. This was the first time the entire convention was housed in one facility. It also presented a huge challenge the first year with the last minute discovery that the contractor who was building the sound control partitions had botched the job. A small group from the committee worked through the night to fix the problem. The experience led to a committee project the second year to pre-build more than 50 panels that were installed over night before the convention. The Coruths involvement with the NESRDC seems destined never to end. They served as Dancer Registration Chairs for the 44th and 45th in Sturbridge and they are again filling that role for the 56th and 57th scheduled for 2014 and 2015. Dennis has also spent many days working with the collections of the Square Dance Foundation of New England. The Yankee Clipper Award Committee is pleased to recognize this long history of service with the presentation of the 2013 Yankee Clipper Award.